Snow Tussock from alpine New Zealand is a clump forming grass of great grace and texture. The fine upright growing blades are a soft taupe color that shines in the sunlight. 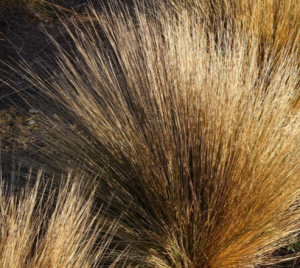 Most often the tips of this grass become cere and it gives it a wilder look. To 2′ x 2′ and a tightly clumping evergreen that increases very slowly. In summer stems clad in tan oat like flowers dangle in a pretty way from the plants top. Full sun to part shade in Well drained, rich soil with light consistent summer moisture. Appreciates an open exposure- avoid neighbors that are too rambunctious or close. Stunning in a mass planting. A great grass for our climate. Do not divide, or move once established.